Fitbit's long-rumored smartwatch, the Ionic, is out and about and on people's wrists. As is Apple's LTE-enabled Series 3 Watch. Naturally, comparisons between Fitbit's first official smartwatch and the current king of the smartwatch game, the Apple Watch, are being drawn. So how do the two compare? The Blaze used to be Fitbit's best bet against Apple's smartwatch, though it couldn't truly measure up in all categories. But now? Fitbit has NFC payments, built-in GPS, music and apps. It's also waterproof and, well, is much more of a fully-featured smartwatch. As for Apple, it's bringing LTE in its new smartwatch, something you won't find in the Ionic – but does that matter? You can also pick up Apple's latest without the cellular extra, which is, for the most part, just the Apple Watch Series 2. So, which is the best one for you? Can Fitbit finally outmuscle Apple's crown wearable? There's no way to get around it – the Fitbit Ionic is ugly. It's not absurdly ugly, it won't burn your eyes off, but smartwatches have come a long way in design since the Blaze first debuted. The Ionic keeps the Blaze's angular look, and while we found it grew on us during testing, it's sure to put a lot of people off. On the other hand, the Ionic is impressive in how it crams a whole bunch of technology into a slim, lightweight case. You've got GPS, NFC, enough battery for four or five days of life and multiple sensors in a 50m waterproof square. Like the Blaze, there are three buttons on display here. You can use the display to touch your way around Fitbit OS, but if your hands are wet or if you're in the water you may have an easier way around with some tactility. And speaking of that display – it's pretty good, with excellent clarity in both low light and glaring sunshine. You'll get the Ionic in three flavours: a silver watch case with a blue/grey band, a graphite grey case with a charcoal band and a "blue orange" case with a slate blue band. But in case you're not down with stock bands, you'll also be able to purchase some nice accessories. There are two-toned breathable sport bands for purchase in three colour variations, as well as handcrafted Horween leather bands in midnight blue and cognac. However, in the looks department, it still doesn't measure up to the Apple Watch. Despite a design that's nearly three years old, the Watch is easier on the eyes. It's nowhere near as nice as some of the Android Wear smartwatches such as the Michael Kors Grayson, or hybrids like the Fossil Q Accomplice, but it still has less of a tech-on-the-wrist look than the Ionic. Variety is the spice of life with the Apple Watch, and nothing has changed with Series 3. You have two different case sizes (38mm and 42mm), three different materials (aluminum, stainless steel and ceramic) and a whole lot of different colours. With the Series 3, you can get the LTE in the whole range, but non-LTE only comes in aluminium. There are also endless band options, from the low-end nylon and sport bands to high-end Milanese Loops and leather bands. Both are using proprietary bands, so you'll be stuck with limited options. Both watches also have special editions married to huge fitness brands. Apple has the Nike+ edition, while Fitbit has teamed up with Adidas for a special Ionic. Another place they both tie is the display, as Fitbit matches the Apple Watch's 1,000-nit OLED display. It's worth noting that Apple's OLED display is sapphire crystal on the stainless steel and ceramic models, but slightly worse Ion-X on the aluminium. Underneath that display is also a 50m waterproof smartwatch that has both GPS and NFC enabled. As for the Ionic, you'll be getting Gorilla Glass 3, which itself is pretty sturdy. The major differentiator between these two is in the build. If you're looking for something to complement every outfit in your wardrobe, and you have no problem with collecting an army of bands, the Apple Watch wins. Fitness might be top of the agenda for both these devices, but notifications are a big part of what makes a watch smart. The Apple Watch has a wide aperture here, receiving all kinds of notifications from all sorts of third-party apps. Even better, a good deal of them are actionable – you can reply, like, etc directly from your wrist. The Series 3 introduces a cellular connection, and therefore a way to get notifications when away from your phone. Responding to notifications on the Watch, while doable, isn't the best experience. A less-than-brilliant Siri means dictation too often gets it wrong, and scribbling out letters isn't enjoyable when you're on the move. You have the option of custom responses, but that lacks a personal touch. The Ionic does a lot of the basics. There's support for third-party notifications here, so you'll get all your Slack messages and presidential tweets and what have you, but it's not quite the third party free-for-all that the Apple Watch is. These notifications are only for apps with built-in Fitbit support, and though that list is growing, the ecosystem still isn't as vibrant as Apple's. You also can't respond to messages from the Ionic, though you're able to read all your notifications in full – unlike some wearables out there that prefer to truncate messages, pushing you to your smartphone almost every time. Overall, Apple Watch handles notifications best – for now. We expect the Ionic to get better support as third-party developers start building apps, although we don't expect there to be any changes in dealing with those notifications when they arrive. Speaking of ecosystems, the Ionic is Fitbit's best go yet at creating one. There's an app store here, which Fitbit refers to as a 'Gallery'. It debuted with just apps from Pandora, Starbucks, Strava and AccuWeather, but that has grown, adding apps from the likes of The New York Times, Nest and more. Apple has had a head start in getting developers in tow, and it'll take a while for Fitbit to catch up. There's 2.5GB of space for you to either store offline music from Pandora or from your own library; if you're outside of the US, you'll get Deezer as your streaming option. However, since the Ionic doesn't have cellular capabilities, you can't stream music without your phone around. The Apple Watch has third-party music services like TuneIn Radio and Pandora, and you can also sync your favourite playlists to your Watch for later listening standalone-style. If you do want to sync over your music, you'll have 16GB of storage to do so, much more than on the Ionic. Apple Watch gets a further upper hand with the introduction of Apple Music on the LTE model, letting you stream music on the go and without your phone. That means you'll need to be on Apple's music platform to take advantage – no Spotify support is in sight – but it will let you stream those beats without a phone. It's not just music either, there's a Radio app that lets you stream stations like Beats 1 and NPR. Another thing you can do from your wrist is pay for things. Apple Pay has been around for a while now, and has been steadily building up its network of issuing banks and card providers all over the world. While it still doesn't have global coverage, it's getting there, and is perhaps the best option on the market if you want to pay from the wrist. There's also Apple Pay Cash available on the Watch, which allows you to easily send money to a friend. Fitbit Pay is the company's foray into payments, thanks to its purchase of Coin. You can take your American Express, Visa or MasterCard and link it up to Fitbit Pay, as well as debit cards from "top issuing banks". You also add up to six payment cards to Fitbit Pay, while you have a limit of eight on Apple Pay. While the Ionic plays some good catchup in the realm of music and NFC payments, the maturation of Apple's ecosystem gives it a bit of a nudge here. 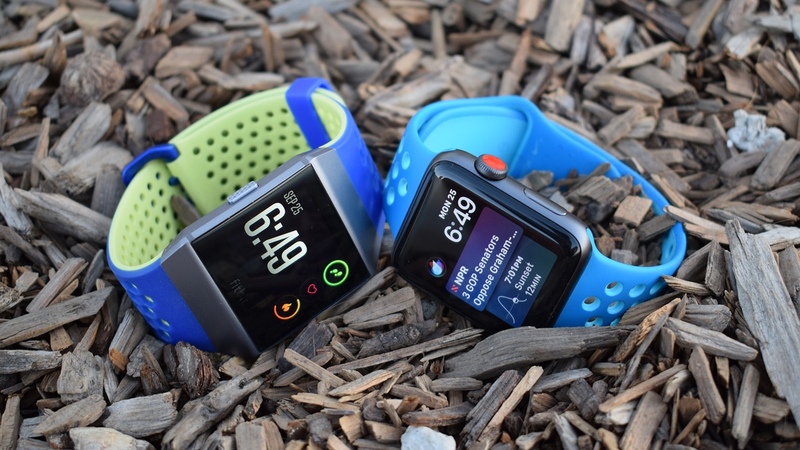 However, as Fitbit gets more time to get major apps up and running, Apple may have a serious competitor to worry about - LTE or not - especially as more Pebble developers join Fitbit's budding platform. The story of fitness on both the Apple Watch Series 2 and Fitbit Ionic is one of transition – for now. Fitbit has always been up there at the top with fitness features, and at first blush it doesn't look like the Ionic will be any different. Out of the box, you have running, cycling, swimming, treadmill, weights and interval training, with a more generic "workouts" for the rest of 'em. Fitbit started with fitness, and arguably knows it better than Apple does, so it should be no surprise that the Ionic is primed for tracking a wide range of workouts. There are also the usual standard of Fitbit fitness features, like SmartTrack, VO2 Max and Sleep Stages. The Apple Watch, on the other hand, doesn't officially recognise as many workout modes as the Ionic. For instance, it doesn't have a mode for weights or interval training. The Apple Watch also doesn't automatically track your workouts like the Fitbit does for running, and there's no sleep tracking, either, unless you turn to a third-party app (and don't mind charging your smartwatch the next day). The Ionic is only the second Fitbit to utilise GPS, after the Surge, allowing it to match the Apple Watch in this regard. In our testing, we found the Ionic's GPS data to be pretty on the money, and it didn't take too long to actually lock on, either. While Fitbit's PurePulse technology has been hit or miss in the past, it's always struggled at high intensities. With the Ionic we've still found it to be a bit uneven at high intensities, but we hope Fitbit can tighten up its algorithms. And we can't forget about the Ionic's new red light and infrared sensors, which will allow the smartwatch to gauge SpO2, the amount of oxygen in your blood. While this won't do anything immediately, Fitbit is hoping to use this data to further down the line to track conditions like sleep apnea. Finally, Fitbit is debuting Fitbit Coach on the Ionic. It's basically a new version of Fitstar, giving you a curriculum of workouts the company says will tailor to your personal needs the more you use it. This has so far remained very basic, in comparison to the smartphone equivalent (only three workouts are currently available on the watch), but we're hopeful this improves over the first half of 2018. With watchOS 4, the Apple Watch does some light personalised coaching, but it's mostly on how to close your rings, giving Fitbit the nod here. For the Apple Watch, Series 3 adds elevation tracking, while watchOS 4 finally brings resting heart rate to the platform (unless you're using an original model). The software update also adds support for VO2 Max and interval training, as well as support for more workouts. With Apple GymKit, you can also tap your Watch to gym equipment, giving you a more accurate reading of your activity. The issue with this is that the feature is incumbent on the equipment rolling out to gyms, which naturally takes time. Biometrics aside, the addition of LTE might be one of the best "fitness" features Apple has added in Series 3, in that it now means you can head out for a run, cycle or swim and leave your phone behind, while still getting notifications, calls and messages. That's one thing the Ionic can't do. It's also worth making a quick note about each device's companion app, since you're likely to be spending some considerable time in here reviewing your workouts and such. It's long been our view that the Fitbit app is perhaps the best companion provided by all the major players, giving you an intuitive, clean way to navigate the different areas of your tracking - whether that's sleep graphs, heart rate history, active minutes or anything else. Apple, on the other hand, doesn't meet the same standard. Information gathered by the Watch is instead parcelled out separately over Activity and the Apple Health app, while the Watch app is essentially your base for changing settings and updating. It's clunky, and Fitbit definitely has the edge here. Back to the question of fitness: this is all really about potential. While it's not all working out of the gate, the technology inside the Ionic is built toward a long-term plan that includes things like sleep apnea and atrial fibrillation, while the Fitbit Coach platform is more in-depth than anything Apple has right now. The Apple Watch Series 3 is better suited to future-focused fitness abilities. For now, Fitbit's the winner in this category. For as long as the Apple Watch has been around, it's gotten about a day of battery life. Sometimes it'll do less, but most of the time you get about a day – a day and a half to two days if you're really frugal about features. With a mixture of using LTE and non-LTE features in the Series 3, you should still get around that, but using the call feature will cut it dramatically. In fact, Apple quotes only an hour of continuous talk time on the Watch. The Ionic, on the other hand, will net you up to five days of battery life, or up to 10 hours when using GPS or playing music. That's decent from such a slim device with as much power and many features as it has. If you have to make your decision based on battery life, the Fitbit is the clear winner here. Those extra days mean it's much more viable as a sleep tracker too. The Apple Watch Series 3 has a wide range of prices, starting as low as $329 without LTE, $399 with the cellular connection, and then climbing up further depending on your choice of materials. It really depends on what you're looking for, and how chic you're willing to go. Bands will cost you at least $50, but again climb up into the hundreds. The Ionic, on the other hand, is on sale for $299.99. You'll also be able to purchase some bands for $29.99 to $59.99. There's a richness to the design and features of the Apple Watch Series 3 that's difficult to top. It has a mature ecosystem that's growing, it's got a plethora of colours and accessories, and Apple continues to support even older models until they're far too long in the tooth. That said, the jump from Series 2 to Series 3 is primarily about LTE, so if you're still wearing a Series 2, bear in mind that the gains aren't massive. However, the Fitbit Ionic feels like a fitness device built for the future of fitness. If the company can actually deliver on its ambitions, including tracking things such as sleep apnea and atrial fibrillation, along with its in-depth Fitbit Coach platform, it's hard to look away from. If it comes down to health and fitness, Fitbit definitely takes the crown here for its feature set. If it's a strong smartwatch platform you're after, the Apple Watch is still to be beaten.